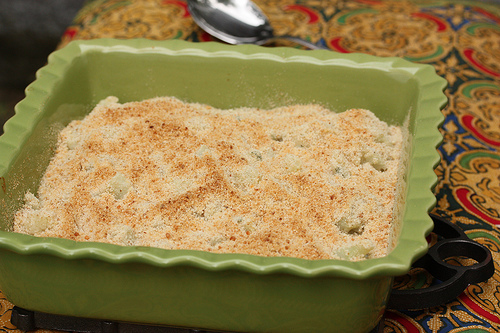 Cold fall days are settling in, and warm casseroles are on the menu! I have to admit that cauliflower is not one of my favorite vegetables, but I love this dish, in which cauliflower is baked in a classic French bechamel (white) sauce. photo courtesy of Meal Makeover Moms, whose kids loved this recipe! White Sauce: In a large frying pan, melt the butter at medium heat. Sprinkle in the flour, stir well (until flour is absorbed), then raise the heat to high and immediately add the milk, SLOWLY (to avoid a lumpy sauce), stirring constantly. After about 3 to 4 minutes of stirring, the sauce should thicken. Stir in salt, pepper, and nutmeg (if desired). Set aside. Now, drain the cauliflower (which will be soft but not floppy), and place it into a buttered casserole dish. Pour your white sauce on top, sprinkle with breadcrumb mixture, and bake for 15 minutes or until top is golden-brown and crunchy. « Market food to your kids: It works! This is a childhood recipe ( I am French) and I have a tip from my mum for those who find the cauliflower taste still strong . If you use a pressure cooker to cook your cauliflower ( cauliflower in basket , water underneath) , put some hard pieces of bread ( equivalent of the end of a baguette) in the water , it will nuance the strong taste of the cauliflower 🙂 . Bon appetit ! Good luck with the Lima Beans….would love to hear how it goes!! I hate cauliflower. Or so I thought. There are a few veggies, only a few, that I just have never cared for. I grew up eating microwaved veggies with Country Crock on them and in general, just a really terrible diet. Then I became a vegetarian and opened up a whole new world. I’m eating meat again but have held onto some of the “dislikes” I had. Reading your book has encouraged me to open up my palate even more. I don’t want to give my 8 month old son any of my aversions. So, I’ve decided to tackle each veggie, one at a time, until I like them all. Cauliflower was the first one to tumble. This recipe is wonderful! Thank you so much for sharing and for challenging us to change our own eating habits! My son will eat anything and everything and I love it! As for me, next up; Lima Beans! The changes look good! It’s definitely better to spell things out more with recipes. It doesn’t take much to confuse me when it comes to cooking! If I try this again, I will let you know how it turns out! Really helpful comments – obviously I needed to spell things out a little more! Definitely true about the milk re: lumpy sauce. I’ve made some revisions to the recipe as suggested! I made this today and it was all right but the instructions could be improved. For example, when you sauté the onions in the butter, and then remove the onions from the pan, there really isn’t enough butter left in the pan to absorb the 3 tbsp of flour. Then, if you pour in the 2 cups of milk “immediately”, as the recipe says, you get a lumpy sauce. Add the milk SLOWLY, whisking constantly to avoid lumps. Also, after you’ve spooned your onions to the casserole dish, you should stir it all together to have an even distribution of onions and cauliflower. Overall, the result was fine, but it was a lot of work just to have cauliflower. It requires dirtying 3 dishes (frying pan, pot to bake cauliflower, casserole dish). It also took longer than 10 minutes to make – more like double that for me (including washing and chopping veggies, sautéing onions etc.). 4 tbsp of butter is also a fair amount of fat to add to an otherwise very healthy veggie. Next time I’ll just steam some cauliflower and make a béchamel sauce to pour over top, or a quick cheese sauce with some sharp cheddar for a bit of tang. It would be quicker and easier (and probably lower fat). I made this last night with my 22-month-old. She had fun helping me layer the veggies and sprinkle the bread crumbs on top, but she didn’t want to wait for it to bake! That sauce is yummy. I also threw in a grated zucchini. I should have squeezed more water out of it before adding it, but otherwise it worked great. Used red onion, and together with the zucchini, it came out quite pretty – and delicious! Thanks for the great recipe. I think this could be modified in many ways with other veggies, too! I make this combined with macaroni, cheesy macaroni-cauli . My youngest boy who loves pasta but not keen on veggies YET, will eat substantial amount of cauliflower. This is a favourite in our home. Of course we add cheese. Some people use it as an accompanient but I love it as a simple meal. Yum. Going to try this for sure. Thanks! I might try this with the Romanesco cauliflower I got this week in my weekly veggie basket! Thanks! I admit to having to work at liking cauliflower…it took a little time, and this recipe helped a lot! Our older doesn’t like any kind of cheese 😦 so she isn’t quite ready for cheese-topped vegetables yet. I keep telling her to practice tasting until she learns to like it. One of these days!